It is important to keep pace with the times and dare to be a bit unconventional. 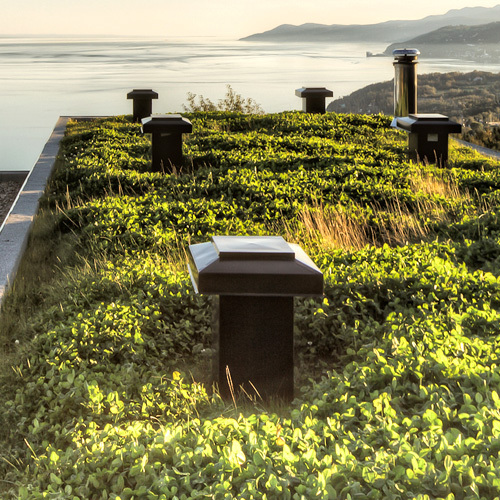 Green roofs are an increasingly popular choice with proven benefits. An innovative roofing option that is also lush, beautiful and eco-friendly. Green roofs have insulation and thermal properties, and provide flood protection by retaining a huge volume of water. This type of roof will help you adopt a more ecological life style, with the added advantage of providing filtered rainwater for re-use in gardens and bathrooms. Contrary to popular belief, you can opt for a green roof without becoming a full-time gardener. Depending on the type of green roof you chose, a bare minimum of maintenance may be all that’s required. You can choose the extensive, semi-extensive or intensive option. Extensive roofs require only limited, simple maintenance. Semi-intensive and intensive require increased maintenance, on a regular basis and are generally used for new constructions that are able to support greater weight. When designed and installed by professionals, green roofs present no risk, nor are they the source of any particular problems. Provided, of course, that roofing professionals are called in to determine the type of insulation, support and substrate needed. Toitures PME boasts years of green roof expertise. We have considerable experience and are able to avoid beginner errors and pitfalls. Go to today’s experts for the roof of tomorrow.